Is Our Phases of iPad Integration Ready? 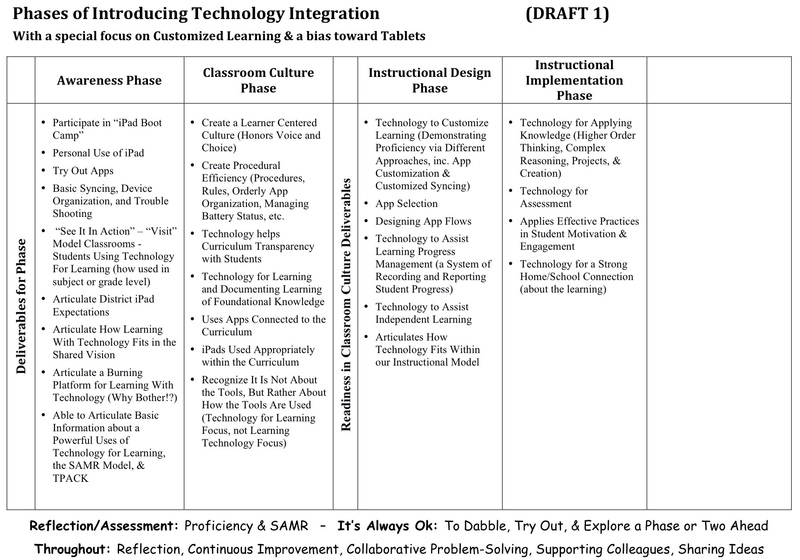 Last August, one of our Auburn-and-friends work groups developed a draft Phases of Tech integration. Now, we don’t believe any of our work is permanent. We know that as we get better at what we do, we’ll figure out how to improve our models. After we use this Phases of Technology document for a while, it will be ready for a revision. We don’t need “perfect.” We’ll learn a lot by living with the model for a while. But we want to kick the tires on this version a little, and insure it is “good enough” to live with for a while. This entry was posted in Advantage2014 - Auburn iPads, Doing 1to1 Right, Professional Development, Technology for Learning, Technology Policies and Leadership and tagged Aubschl, Aub_Adv2014, Distributed PD, ECE_iPads, iPad, PD for Paradigm Shift, Phases of Integrating Technology, Supporting Teachers on January 25, 2014 by Mike Muir. #5 – The Series on the New MLTI: Choice, Auburn, and Learning – This year, Maine's 13-year-old learning with “laptop” initiative offered schools a choice of devices. This series describes the change in approach to the state initiative, why Auburn chose iPads, and what we still hope to get from our technology, despite the changes. #3 – Life-Long Habits of Mind: Curriculum for Customized Learning – Districts in the Customized Learning Consortium have expanded their curriculum model beyond simply content knowledge. Life-Long Habits of Mind is the third domain of our curriculum model. #2 – We Need Keyboards With Our iPads. Not! – While some believe that schools should buy keyboards to make iPads useful, lessons from experienced iPad schools suggest the opposite. #1 – How Does Auburn Select Apps? – Ever since we started Advantage 2014, our primary grades 1to1 iPads initiative, we’ve had educators and parents ask us what apps we’re using. #1 – What Makes for Good Learning Experiences? #5 – Student Motivation: What Level of Engagement Are Your Students At? This entry was posted in Customized Learning, Motivation, Teacher Practice, Technology for Learning and tagged Apps, Curriculum Organization, iPad, Keyboards, Life-Long Habits of Mind, MLTI on December 31, 2013 by Mike Muir. Note: This is a guest post by Auburn Middle School (AMS) Technology Integrator, Carl Bucciantini. The article originally appeared in the Dec. 2013 Issue of the Auburn Middle School Newsletter. Over the past few days I’ve received several phone calls from parents wondering what kind of keyboard to purchase for their children. While there are lots of options available, I find myself wondering if a keyboard really necessary and what is the driving force behind the “need” to have one?” I think decisions such as these are often made based upon perception or personal experience. Further, as adults I think we assume that our children can’t possibly “type” as well using a touch pad as they could on a keyboard, partly because of our own challenges with touchpads. Brady Cline did a nice small-scale study with students in grades 3-6, which showed no significant benefit to using the physical keyboard. Some people criticized that study, saying that none of the students were particularly fast typists. So, it's worthwhile seeing how well an adult who is a reasonably experienced typist performs with the iPad. A 2010 study by Chaparro et al. (when the iPad had just been introduced) showed that people who had never typed on an iPad performed at around 45 words per minute (wpm) right off the bat. The same people typed about 15wpm faster on a netbook keyboard – but they had a higher error rate on the physical keyboard, and overall reported higher typing satisfaction on the iPad. A 2013 followup study by Chaparro et al., this time using a dedicated external keyboard on the Microsoft Surface, confirmed these results. Needless to say, practice improves iPad keyboarding speeds. I don't know of any study that has final numbers on improvement, but light regular use is reported to get you to about 54wpm, and there are multiple videos on YouTube and elsewhere of people typing 60wpm to over 100wpm on an iPad without breaking a sweat. There are some very interesting studies coming out on using the iPad “on the go” (Trudeau et al., 2013), where using a regular keyboard is difficult or impossible. As you might expect, typing speed goes down in these scenarios (to about 23wpm on a split keyboard layout, 25wpm on a regular layout), but the split keyboard layout (mostly thumb typing) was found to be considerably more comfortable. Given that in these scenarios the physical keyboard performs at about 0wpm, I would consider those numbers quite respectable. My personal belief is that whether they use a touchpad or a more traditional keyboard, kids have an uncanny ability to adapt. My advice is if you’re looking at purchasing a keyboard, ask your child why they think they need one, how it will make things better for them and suggest that they borrow one from the AMS library for a week or two to try it out. This entry was posted in Advantage2014 - Auburn iPads, Leadership, Technology Policies and Leadership, Technology Resource Management and tagged Disruptive Uses of Technology, iPad, Keyboards on December 17, 2013 by Mike Muir. We Need Keyboards With Our iPads. Not! This past summer, Maine's schools got the choice for the first time to purchase tablets as part of the statewide 1to1 learning with “laptop” initiative (MLTI). It has spotlighted an interesting demand related to tablets: we need to get keyboards so students can use the tablets. I kind of understand why people might think this. The virtual keyboard on the iPad does take a little getting used to, especially if you're a pretty good typer on a regular, physical keyboard. Also, adults and students hear other adults say, “we need keyboards for our tablets.” And the idea is reinforced by the TV ads for some tablets that state theirs come with a keyboard “so you can do real work.” Locally, we even have an owner of a call center claiming (while pounding his fist on the table…) he won't hire any of our graduates because they won't be able to type on a physical keyboard. My own experience with a full sized iPad is that it took me a couple weeks to get used to the virtual keyboard, but now I type on it as fast or faster than I do on a physical keyboard. And I have heard similar stories of parents or community leaders in other districts demanding keyboards because of the hard time they personally are having typing on the onscreen keyboard, but a couple weeks later saying “never mind” when they have developed familiarity with it. Admittedly, if I'm doing any quantity of writing on my iPad mini, such as writing this post, I do use a bluetooth keyboard. My hands are just too big to do anything more than a modified hunt and peck on the smaller keyboard. But the core of this debate is not about the size the keyboards on the (smaller) screens, but rather about onscreen vs physical keyboards. I do believe that some folks really do need a different keyboard or sometimes need a physical keyboard. MLTI provided keyboards in something like a 1-to-10 or 1-to-7 ratio to the number of student iPads. We have put those in a keyboard lending program in our school libraries (students can check them out as needed), and a few students with a specific need have one permanently assigned to them. We even have students and families who have bought their own keyboards or keyboard cases (but that was a personal choice rather than a universal demand). But the real issue that keeps coming up is the question, does everyone (or even just most students) need a keyboard? Districts in Maine that have experience with 1to1 iPad initiatives had interesting things to say when the question of keyboards was posed on the state technology email list. In our high school, we bought around 40-50 iPad keyboards for use in English and Social Studies, and also in our Library. This was in response to concerns from teachers, rather than from students, and although they did get used, they got used primarily because the teachers wanted them to be used rather than students needing to use them. They certainly got used less and less as the year went on and even teachers who borrowed them stopped using them as they ended up finding the onscreen keyboard just more practical. This was based on concerns from the administration and staff that student's would need a keyboard especially for typing long papers. Two years later and (my opinion) most students do not use the physical keyboards. Last year's class used it less than the previous class. What I am seeing is that the more the iPad and its virtual keyboard become mainstream the more the students are used to virtual typing before they are ever issued an iPad. Had we stayed with our original plan, I was not going to purchase keyboards this year. We bought 50 keyboards for our Elementary School iPads when we started the program 2 years ago. The thought was that 5th graders were going to need them to be able to type papers. 48 of the keyboards are still sitting in a closet unopened because they just have not been needed. The other two I have loaned out to staff but they always bring them back because they don't use them. We're beginning year 3 of our 1:1 iPad program for all of our grade 9-12 students. We bought a few keyboards in year 1…They've received almost no use. There are plenty of barriers to student writing, but I can assure you that the virtual keyboard is not a substantive one. And, with built-in speech-to-text on these fancy new MLTI iPads, the virtual keyboard is even less a barrier. In short – buy a few (no more than a handful) if you must, to show that you're listening, but know that they are very likely to gather dust. We plan to disallow external keyboards for iPads in school, unless the school determines that a student needs one. The thinking is that students will learn the iPad quickly enough, and that we don't want to set up for “have's and have-nots,”…. also the experience of our teachers using iPads, is that even an adult can learn to process text on an iPad. That educator went on to say that when parents inquire, they have been referencing the articles here and here. Some can't understand how you can interact in an educational setting with a device that does not have a keyboard with keys on it. An English teacher here, who was using Edmodo, had a student submit a lengthy paper the student had “thumb typed” on their iPhone!! Don't worry, the kids are all ready there or they will adapt very quickly. We just need to get out of the way. I am empathetic to folks having fears and concerns about “new” technology they have only a cursory understanding of. This keyboard issue is a common perception about iPads. It is on us to make the argument (politely and diplomatically) about what works (not what is perceived or guessed or intuited or philosophized…) and provide the evidence that it works (such as through the stories that have been shared here). This entry was posted in Advantage2014 - Auburn iPads, Doing 1to1 Right, Food For Thought, Leadership, Technology Policies and Leadership, Technology Resource Management and tagged Disruptive Uses of Technology, iPad, Keyboards on December 8, 2013 by Mike Muir. But, in my view, it is largely a misplaced concern. It is worrying about the wrong thing. And I recently came across this article that seems to have similar views. It’s not the screentime that causes obesity! When we have kids locked up in classrooms all day, and locked inside with homework at night, how can we possibly blame the screens? If we want our kids to be fit, we can rethink homework, bring back significant recess, and let kids go out and play. Much more in the full article, here. This entry was posted in Technology as Tool For Learning and tagged Aub_Adv2014, ECE_iPads, iPad, Research, Screen Time on November 30, 2013 by Mike Muir.